#MySundayPhoto Number 42 is of Bear helping me make cookies. 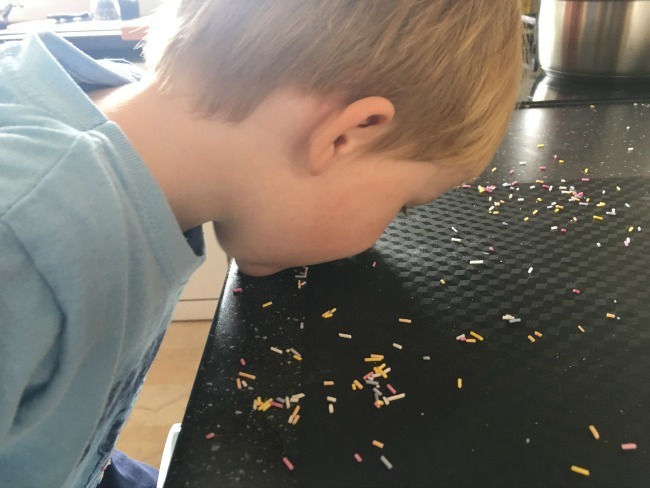 I know it looks like he's just eating sprinkles straight from the work top but he couldn't use his hands as they were covered in biscuit dough! Recipe and how we got on, up on the blog soon. Do you bake with your toddler? What are your top tips for success? You can't let any sprinkles go to waste! I love fun moments like this. Such a great one to capture. #Blogtober16 Day 21 What Am I Afraid Of? Contactless Payments. Are They The Future? #Blogtober16 Day 18 Zodiac Sign And Does It Fit? #Blogtober16 Day 13 What's In My Fridge? #Blogtober16 Day 7 What Made You Start Blogging? #Blogtober16 Day 1 Who Are You?